Swan Neck Drawer Pull with Round Rosettes. Rosettes measure 1 inch diameter. Available in three sizes: 2 inch centers, 2 1/2 inch centers, 3 inch centers, or 3 1/2 inch centers (with 1 1/8 inch diameter rosettes). 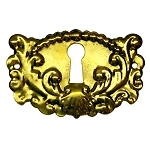 Solid Brass construction in choice of polished or antique brass finish (excluding the 2 inch version). Includes screws.